"Lex Orandi - Lex Credendi"
Pope St. Gregory I, "the Great"
Pope St. Gregory the Great was the second to be called "the Great," and he was the first pope to have been a monk. He was one of the most influential writers for the papacy. He was a junior deacon at the time of Pelagius II's death, yet he was elected unanimously. He immediately wrote the emperor to withhold his approval for his election, which was then required. The emperor did not withhold his approval, and so when the imperial mandate arrived, Gregory accepted consecration as Bishop of Rome under protest. Gregory was a vigorous promoter of monasticism and of the liturgy, especially music. His name is forever associated with plainsong chant. Every day, he fed at his own table twelve poor pilgrims, whom he insisted on serving himself. We are told that one day when he entered the dining room he saw not twelve men, but thirteen. He inquired of his steward why there was an extra guest, but the astonished steward maintained that they had only the usual number. "I am sure I see thirteen!" the Pope insisted. As the meal progressed, Saint Gregory noticed that the countenance of one of his guests kept changing from time to time. Now he would find himself looking into the face of a handsome young man, and again his gaze would fix itself on the same face become suddenly old and venerable. When he could stand the mystery no longer, Pope Gregory drew the strange man aside. "What is your name?" he asked him. "Do you not remember," his guest replied, "the merchant who came to you one day at Saint Andrew's Monastery and told you that he had lost all his possessions in a shipwreck, and whom you gave twelve pieces of money and the silver dish which was your treasured remembrance of your beloved mother? I am the merchant to whom you gave your mother's dish. Rather, I am the angel whom God sent to you to prove your charity. Now, do not fear," he added, seeing Saint Gregory's trembling amazement, "it is for the alms of that silver dish that God has given you the Chair of Saint Peter. And behold, God has sent me to be your guardian as long as you remain in this world. Whatever you ask will be granted you through me." In art the great pope is usually shown in full pontifical robes with the tiara and double cross. A dove is his special emblem, in allusion to the well-known story recorded by Peter the Deacon (Vita, xxviii), who tells that when the pope was dictating his homilies on Ezekiel a veil was drawn between his secretary and himself. As, however, the pope remained silent for long periods at a time, the servant made a hole in the curtain and, looking through, beheld a dove seated upon Gregory's head with its beak between his lips. When the dove withdrew its beak the holy pontiff spoke and the secretary took down his words; but when he became silent the servant again applied his eye to the hole and saw the dove had replaced its beak between his lips. 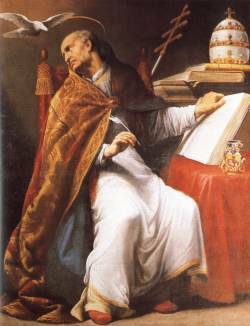 Pope St. Gregory the Great lies in the Basilica of St. Peter in Rome. Sancte Gregori, ora pro nobis.